If you've never heard of Roccat gaming gears before, it's big time you should. Roccat is a Euro-based company which entered the scene in 2007 with its Roccat Kone, it's first gaming mouse, and has since launched a few products ranging from headgears to gaming keyboards. Though not as big as Razer or Steelseries yet, it is gaining popularity as it expands around the globe and reaching towards the Asian market. In February, the company unveiled it's latest innovation - the Roccat Savu, a medium-sized gaming mouse which aims to blend performance and fancy features in a robust, ergonomic design.It is equipped with its advanced Pro Optic sensor, delivering up to 4000 dpi optical sensor power which empowers pin-point accuracy and ultra-precise feedback. The Roccat Savu also comes with its Easy-Shift [+] technology which acts as two sets of functions for each mouse buttons including the scroll wheel, thus essentially transforming a 7-button mouse into a 12-button one without any unnecessary cluster. As it allows you to switch between functions, it also enables the instant change between dpi settings. This is particularly useful in FPS games when you are in sniper mode and you can automatically reduce the settings to suit the situation. 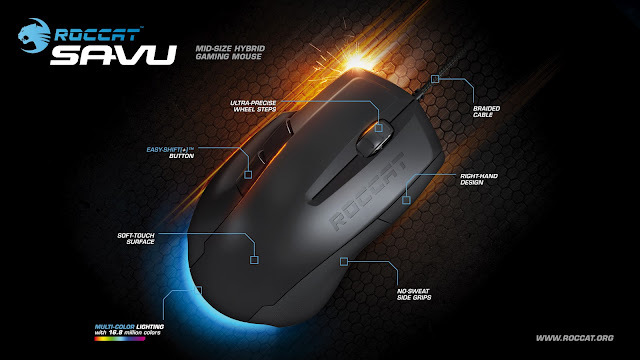 At the same time, the Roccat Savu features a lighting system which is adjustable through 16.8 million colours. Sounds kinds Tron-ish, maybe? But ultimately, it is its all-new, one-of-a-kind, world-first Roccat Achievement Display R.A.D that makes the cut for the Roccat Savu. You know the many "stats and achievements" systems out there, mainly for online games and even like Game Center of iOS devices? Well, the R.A.D is basically that except that is is specifically tailored to track the 'stats' of the Roccat Savu. Yeap, you heard me right. It's to track your all-time gaming feats like mouse movement, button clicks and scroll steps which can essentially provide a range of statistics and analysis of your gaming. Though it may or may not exactly help you, it will surely provide you a hell lot of new, entertainment besides gaming itself as it rewards you with trophies and achievements, and also allows you to show them off on Facebook. I mean, just imagine you showing off your level 10000 "scrolling abilities" to your friends. LOL. 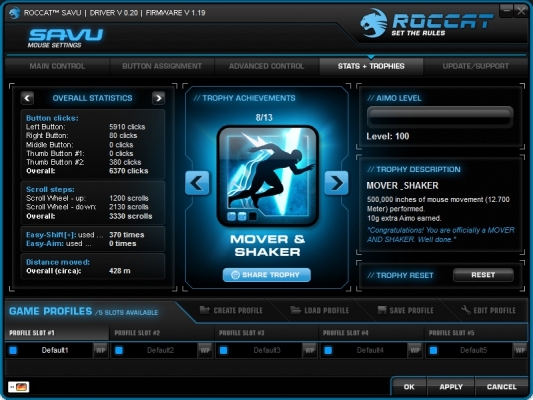 *Roccat Savu is available start May 1. *If you are from Malaysia/Singapore, the official distributor is Answer Sdn.Bhd.